• Chick pea flour - 2 cups. • Rice flour - 1/2 cup. • Onion - 1 cup. • Baking soda - 1/4 tea spoon. • Green chili - 4 numbers. • Ginger - 1/2 tea spoon. • Coriander leaves - 1/2 bunch. • Cashew nuts - 10 grams. Take a mixing bowl add chick pea flour, rice flour, salt, baking soda mix it well, then add chili powder, ghee mix it like shot crust method, keep it aside. Take another bowl add slices of onions, salt, chopped green Chili, ginger, curry leaves, coriander leaves, mix it well and rest it for few minutes. Make them into roundels and deep fry in the hot oil till it get golden in color. Patnam Pakodi is a very popular street side snack in Tamil Nadu. This type of pakodi is also known as Onion pakora, Ulli pakodi, Pattanam pakoda etc. Patnam Pakodi is an amazing deep fried lentil fritter that is extremely delicious to taste, crispy outside and soft inside. The patnam pakodi is brilliantly made with a mix of sliced onion, spices, chickpea flour and rice flour mixed together, made into roundels and deep fried until golden in colour and crisp. This deep fried yummy savory snack is an ideal to be served during tea time especially during monsoon season... Read More.. This deep fried yummy savory snack is an ideal to be served during tea time especially during monsoon season. Pakoda or Pakodi Pakora or Pakoda is a deep fried savory snack popularly prepared across South Asian countries. Bajji is a simple dish prepared by dipping the sliced vegetable in the batter and deep frying it. Pakodas is one snack which is synonymous with the advent of rainy season. A plate of hot crispy batter fried pakodas prepared with different types of vegetables like the potato, brinjal, raw plantain, bread, banana chillies that melts in your mouth is very addictive. The batter made out of chick pea flour is versatile because you can dip almost any vegetable you like or bread or paneer to make the most delicious of Pakodas. A version of pakora made with wheat flour, salt and tiny bits of potato/onion (optional) is called Noon Bariya (Noon means salt), typically found in eastern Uttar Pradesh in India. Pakoras are usually served as snacks or appetizers. They are also sold as fast food snack as an alternate to french fries or kebabs. They are served normally during weddings, birthday parties or any special occasions too. In Southern India, such preparations are commonly known as bajji rather than pakoda. For instance, potato bajji is sliced potato wrapped in batter and deep fried. In such states, pakoda is meant a mix of finely cut onions, green chillies and spices mixed in gram flour. This is rolled into small balls or sprinkled straight in hot oil and fried. These pakodas are very crispy on the outside and medium soft to crispy inside. There is also a variety that is softer overall, usually termed Medhu Pakoda in restaurants. It is relatively softer (like the pakoras) and made of any other ingredients such as potatoes etc. The word pakora is derived from Sanskrit pakvavaṭa, a compound of pakva 'cooked' and vaṭa 'a small lump' or its derivative vaṭaka 'a round cake made of pulse fried in ghee'. Preparing the Pakoras is quite simple and fast. As preparing the dish of your selected vegetables is still awesome. A plate of hot pakoras with a spicy dip or sauce is bliss to the taste buds. They are absolutely refreshing and satisfying food that most of us wish to eat in between meals. They are exclusively dough- or batter-based foodstuffs. Pakodis or Fritters make an awesome side dish or snack and can be made with almost any vegetable you like and a brilliant way to use up all the leftovers. Savoury fritters are best made with chopped vegetables and spices. They can be made with corns, potatoes, eggplant, long and big variety of chillies, onion, mushrooms etc and you could also make meat fritters with prawns, fish, poultry etc. Do prepare this delicious popular Tamil Nadu snack and have a wonderful treat with the family. Look down for the recipe and enjoy cooking. 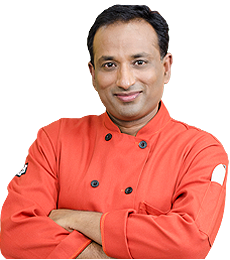 We've been looking for some good Indian Cuisine tutorials and you are our 'Go To' chef! Thank you for the excellent instruction and your enthusiasm. Can't stop at one for sure! Eat the whole plate, Chef!? What is a substitute if we do not have besan flour?? Hi chef ur dishes r very delicious.......? Ad: 5,4,3,2,1, Skip ad....vah chef's video begins!! yayyy!? Added to my ToDo list :) thnx? What kind of oil is best for deep frying?? I want to make these, but can't eat fried foods ... can I bake them? How long and what temperature ... Is 180 degrees C the same as 350 degrees F? ... Thank you for this recipe. Namaste'.? Just made this today at it was fantastic! Thank-you for sharing such great recipies with us.? Wat wrong ur neighbour state tamilnadu did? tn people miss ur awesome shows.learn it for us.just for fun sir?